At the time of writing the Weinstein affair remains an ongoing and evolving media phenomenon. The hypocrisy of this one does my head in. Imagine … All men being demonised for being the same gender as the alleged perpetrator at the centre of a major scandal. Men offer comments supportive of female victims of sexual harassment, and condemnatory of male perpetrators, but are dismissed or even shamed for doing so. Meanwhile other men are shamed for not commenting. Men subseqently re-frame/qualify their thoughts/feelings in the light of well-publicised research – research that proposes that men understand and empathise with women better when they have sisters, wives and daughters. Men are then shamed on the basis that their amended and qualified message of support doesn’t treat women as humans. Men, the beasts that they are, just can’t seem to say or do the right thing. Women are a different kettle of fish. It goes without saying that nowhere, nowhere are they responsible. For anything. Not for being victims or alleged victims. Not for helping Harvey trick/lure women into private meetings in hotel rooms (their excuse). Not for willingly following the casting-couch route to financial rewards. Not for remaining silent when they knew what was going on, in many cases accepting payment for doing so. And absolutely not, for they themselves harassing others. Note that I have addressed the topic of harassment in the workplace in another blog post. This current post is more about feminist shaming, bitterness and hypocrisy set against the backdrop of the media furore surrounding Harvey Weinstein’s real and alleged misbehaviour. Feminists have long been telling men – even feminist men – that they have no legitimate right to talk about feminism, or about specific topics that they (feminists) consider to be women’s issues. They typically assert that men have no understanding of women’s lived experience, and have nothing worthwhile to contribute. Here’s a recent Australian example. This is the backdrop to the emergence of the Weinstein affair. Or at least the October 2017 version thereof. Because, as we are finding out more each day, plenty of people were ‘in the know’ before now. Sure enough, after being given what they assumed to be the media’s ‘green light’ to enter the debate, more men spoke out to condemn Weinstein and/or to condemn the problem of sexual harassment generally. Does any reasonable person seriously believe that men referencing the girls/women in their lives meant women any disrepect? Think of any other instance where this ‘logic’ has been proposed, because I can’t. I can think, for example of discussions regarding childhood disability or illness whereby parents comment along the lines of “as a parent of a child with autism …“. Were those parents insinuating that their autistic kids were less than human? ‘Cancel the Christmas party’: 2017’s the year of the ‘confused’ man (16 November 2017) Rather than working with men to resolve confusion about what constitutes appropriate behaviour, feminist journo prefers to mock for what she sees as a weak ‘excuse’. Anything but helpful. Ah but of course the feminist lobby will never admit weakness or fault, so their strategy here is to double-down on their ongoing ‘feminist men aren’t feminists’ offensive (example, with more in the opening section of this blog post). In closing, Cathy Young has written an excellent article that touches on a number of the issues mentioned above. Don’t look at me! No wait. Look at me! Diversity is another one of those buzzwords du jour – and apparently the cure for all that ails. Except there are a few problems. Firstly, diversity is often not – in practice – extended to embrace many within the community. I’m thinking here, for example, of white men, non-feminists, and those with a conservative or right-of-centre political persuasion. In this blog post for example I examined the example of a debate organised by the Diversity Council of Australia. In that example, diversity meant assembling two debating panels that represented or supported a range of feminist perspectives. Martin points out that only 12% of those featured on the ‘Power Part-time Top 50’ list mentioned in the article are male. Not so diverse in that regard, huh? Elsewhere Martin provides the example of the organisation ‘CMI Women’, within whose web site we see an exhortation for gender diversity which starkly contrast with their own board membership (100% female). Secondly, those who lobby for diversity tend to want to have it imposed by way of gender or racial quotas, selective recruitment, and the like. They do so despite the fact that such measures need not result in measurable improvements to organisational performance or community harmony, and may even be counter-productive in this regard. Indeed they are not averse to exaggerating or otherwise misrepresenting the benefits of diversity. Thirdly, those who lobby for diversity fail to acknowledge, let alone analyse and debate, the negative outcomes that arise when achieving becomes the major determining factor when adopting government policy. Indeed, if we look at what is happening in some European countries now, such as greatly increased criminal activity, there is evidence of efforts being made to suppress such information. Deliver innovative diversity practice resources and services to enable our members to drive business improvement. The most recent annual report shows income of approx. $1.5 million, of which approx. $1.1 million was generated by annual subscriptions. Although DCA does not appear to the recipient of government grants like so many other feminist organisations, many member organisations are public sector agencies. The staff at Diversity Council Australia comprise ten caucasians, nine of whom are female … but everyone has different hairstyles. Diversity? Tick. The DCA’s “employee benefits expense” in 2015 totaled $871,798, with “key management personnel” compensation paid or payable being $203,873. Imagine an organisation called the ‘Alternative Diversity Council Australia‘ which organised a debate entitled ‘Is engaging women the game-changer for gender equality?‘ (It sounds a bit condescending to even pose the question, doesn’t it?) Oh, and the organisers decided not to have any feminists on either team. In case their views were a little too, you know, confronting. Scarcely imaginable right? The organisers of such an event would be torn to shreds in both the mainstream and social media. It just wouldn’t fly. But thanks to the arrogance and hypocrisy of contemporary feminism all one needs to do is flip genders and everything is magically ok.
And so on the 8 November 2016 Diversity Council Australia convened their Annual Diversity Debate on the topic of engaging men in gender equality. The inclusion of individuals representing more than one national origin, colour, religion, socio-economic stratum, sexual orientation, etc. And so who were the panelists, and just how diverse a group were they? The panelists were Kate Jenkins, Pip Marlow, Stephen Barrow, Clementine Ford, Benjamin Law, and Michael Flood. At first glance similar demographics … but let’s focus on belief systems with regards to gender issues. Were there any men’s rights activists (‘MRA’) amongst them? Anti-feminists/non-feminists/egalitarians? Nope, they are all self-professed feminists (or perhaps pro-feminist/white knight in the case of Stephen Barrow). Further, at least three of the panellists are virulently anti-MRA. Does the panel represent a diversity of perspectives on the issue of gender? Of course it doesn’t. As supporters of the same ideology the panelists represent quite the opposite – they represent a ‘uniformity’ of views. This sounds rather like drafting men into servitude, so perhaps ‘engage’ is not the best term to use here. And indeed, the model of engagement proposed by the ‘yes’ team was very much a one-sided affair. This came as no surprise given the participation of Kate Jenkins, whose predecessor at the Australian Human Rights Commission was Elizabeth Broderick and chief architect of the ‘Champions of Change‘ program. This component of the feminist vision translates into recruiting men in positions of authority as tools to enhance female privilege through the use of shaming and appeals to chivalry. It does not involve any reciprocal responsibility to listen to, understand, or render assistance to men. I’d prefer to think that engagement, in the context of the DCA debate, would entail a two-way symbiotic relationship between men and women, with each group listening to/asking questions – and then committing to help one another. On the contrary, the typical model of feminist interaction when men dare mention issues that detrimentally affect them, is to tell them to STFU and stop being whiny man-babies. Put simply, feminists could care less about helping men, excepting perhaps a few exceptions where benefits to men were collateral spin-offs from the primary goal of enhancing the relative position of women. And let’s not forget the sponsors of the debate: NAB, Optus, Johnson & Johnson, BAE Systems and Boardroom Media. I look forward to seeing these organisations also support causes that benefit the welfare of men and boys, for example the ‘One in Three‘ organisation. The following image says it all. Audience members left the event even more biased against men than they were when they arrived. That’s some negative outcome. A result that’s hardly likely to accelerate progress re: mutual respect and gender equality, is it? But to the DCA this was a “great night“. Was there some way in which DCA might have redeemed this otherwise farcical event? Aside from having a diverse and representative discussion panel? There was one other thing. Readers might have read elsewhere in this blog about the film The Red Pill, and the problems currently being experienced regarding finding screening venues. Why couldn’t the Diversity Council have organised a screening of The Red Pill as either an adjunct to the debate, or as a subsequent event. What better gesture via which the Council establish credibility, in the broader (non-feminist) community, than to arrange a screening of this notable film concerning issues affecting men and boys. If the council truly believed in diversity, in gender equality, and in engaging with men … then they should go ahead and walk the walk … engage. But they don’t. And they won’t. And the gender debate – and the community – is all the poorer as a result. “The course has hosted golf’s prestigious Open championship no less than 16 times in its 125-year history, the backdrop for wins by greats such as Nick Faldo, Jack Nicklaus and Gary Player. The subject of male-only and women-only spaces is one which I see written about fairly often – generally from the feminist perspective. And that perspective is that male-only spaces are uniformly undesirable and should be eradicated, whilst female-only spaces are desirable and much-needed. Which is ridiculous. And just as chock-full of hypocrisy as are most of the other building blocks in that ideological house of horrors that is gender feminism. The topic has been raised in relation to mens and boys organisations and clubs like Men’s Sheds and Scouts, university student houses (frat-houses) and societies, fitness centres, etc. Duke offers men a safe space to contemplate their toxic masculinity (30 September 2016) USA. Related Reddit discussion thread here. My post today begins with a panel discussion entitled ‘Have men become second-class citizens’ that featured on the ‘Sunrise’ TV program in Australia. Mark Latham spoke out strongly in the affirmative sparking the usual immediate backlash. Guardian Australia columnist and feminist activist Vanessa ‘Van’ Badham also upset a few people with her anti-male comments, and subsequently received a slew of feedback via social media. You can review her Twitter account to get a sense of the nature of that feedback. I didn’t notice anything of a particularly hurtful or threatening nature. Indeed, the comments she received were considerably tamer than the noisome effluence that is Van’s contribution to social media. Just as with Clementine Ford, it seems to a case of those who launch the most mud and the sharpest barbs, squealing the loudest when someone dares return fire. Anyway, shortly thereafter I issued a few tweets in relation to the Sunrise program, one of which is shown below. These were not in response to tweets posted by Van Badham (with whom I have never previously communicated), nor were they specifically directed at her. No matter, because I had revealed myself as being one of ‘them’ rather than one of ‘us’. Van Badham chose to respond by alerting an Australian law firm who apparently use a marketing slogan “We fight for fair“. She did so in the vain hope of involving me in some sort of legal wrangle. And in so doing she earnt a ‘like’ from her feminist colleague, journalist Wendy Tuohy, who features elsewhere in this blog. So this is how strong independent women behave? No, but it’s how feminists behave. This illustrates, yet again, that the default position of most feminists is to do whatever it takes to divert attention away from key issues and discourage public discussion thereof. And this means shutting-down and/or isolating dissenters as quickly possible, one example of this are ongoing coordinated campaigns to shut down anti-feminist Facebook pages. Why? Because they know that their best hope of retaining credibility/power is to keep as many people as possible from recognising the expansive chasm between the ‘dictionary definition’ of feminism, and what is actually being said and done by real-world feminists. Discussion can lead to enlightenment, whilst shunning and censorship is more likely to preserve the status quo. Those who have taken the time to read other posts in this blog would have noted that the theme of feminist-imposed censorship emerges again and again in the context of many gender-related issues. This is, in itself, a blazing ‘red flag’ with respect to the true nature of contemporary feminism. Shun this person who doesn’t support feminism! Unclean! Unclean! Van Badham and Steve Price went head-to-head on Q&A (12 July 2016) See also this article in The Age. Response from Steve Price here. Van Badham reveals ugly response to Steve Price’s comments about her (14 July 2016) And of course, her own words and behaviour played no role whatsoever with regards to the subsequent public reaction. Yup, sure. Let’s make it all about Steve … and misogyny. And to suggest that Steve’s solitary off-the-cuff comment constitutes “demonisation” is absurd posturing on Van’s part. Look what I found in a Reddit discussion thread about Van Badham’s stouch with Steve Price … apparently Van wanted to put Tony Abbott underwater. Wait, where have a heard a comment like that before? Oh yes, Eddie McGuire. And on a parting note, an item by Andrew Bolt entitled ‘How Van Badham attacks even children‘ (2 March 2017). Oh come on, someone throw me a bone … I’m serious … after several months and hundreds of hits on this page, not one person has come up with an example. For pity’s sake, there must be at least one example of feminists speaking up against gender equality favouring women that I can showcase here. I think part of the answer to this is that, to a feminist, an area where women are advantaged relative to men is not seem as inequitable (let alone, a privilege) but rather as reasonable compensation for all the other areas where they believe women are still disadvantaged. Would anyone like to suggest other issues to consider here? If the central tenet of feminism is equality then what men’s/boys causes have feminists championed recently? Yes it’s a bold plan but we think we can do it. We’re a cool little organisation and, I tell you, we are 100% into gender equality. Only 10% women by 2017? Feminists would be collectively choking on their breakfast cereal at this point, and reaching towards their IPads ready to unleash a storm on social media. Well, they can relax and busy themselves attending to their cats’ litter tray instead. That’s because the statement in this particular organisation’s web site actually specifies having 10% of the senior management team *male* by 2017. I’ve seen this objective noted in their web site for quite a while now. Three years? Clearly progress has been slow. Perhaps they’re having trouble finding men whose judgement is sufficiently impaired to sign off on media releases asserting that the gender wage gap is proof-positive of an oppressive male hegemony across corporate Australia. 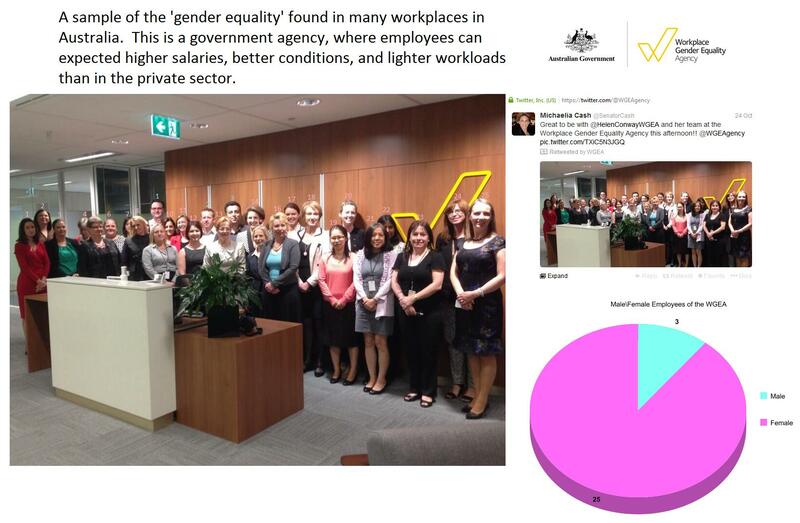 The organisation I’m talking about is the Workplace Gender Equality Agency (WGEA). The WGEA is an Australian Government statutory agency created by the Workplace Gender Equality Act 2012. The Agency is charged with promoting and improving gender equality in Australian workplaces. The relevant minister is Senator the Hon. Michaelia Cash, Minister for Employment, Minister for Women, etc. We taxpayers support WGEA to the tune of $5 million each year, and in return they tell us about stuff that’s really important to feminists like the ‘gender pay gap’. They even have a separate website in which to bang that particular drum. I could divert at this point to talk about how the gender wage gap, in the context it’s presented to us by feminists, is complete hokum that has been de-bunked more times than I’ve had hot breakfasts. Here’s a recent effort courtesy of Forbes. But never mind, at least the ‘pay gap’ gives gender studies students and feminist journos something to write about other than their own angst-ridden lives. Now back to where I started, with the genders reversed. If it was 95% men working in this particular agency, don’t you think that the feminist lobby would scream their heads off? That it wouldn’t be on, or close to, the front page of the paper? Maybe even have its own hashtag? And that the government wouldn’t find a way to immediately address the serious gender imbalance? Don’t bother answering. I think none of us are in any doubt about the answer to that hypothetical.